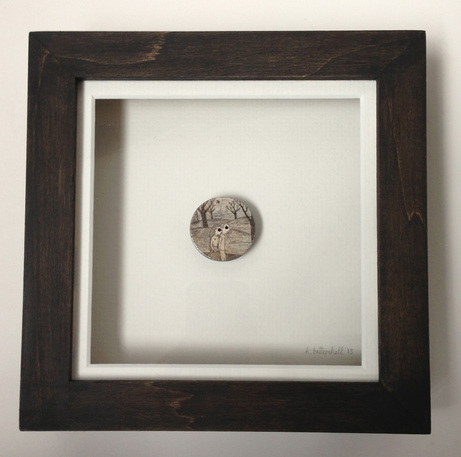 For many years I have made miniature artworks, using a button as a support rather than canvas or paper; they are for looking at rather than wearing! The buttons I paint on come from all over the place, from antiques stalls to the London streets. Some are bone buttons from the American Civil War period, some are handcarved wooden buttons found in the back of a ‘miscellaneous’ draw at a haberdashery. ​I owe a lot to the button underneath the painting for the final effect of the finished piece. These objects bring a sense of previous history- they are overlooked treasures in their own right. The eyes of the portrait being the holes of the button also lends a spookiness and sense that the scenes before you are taking place in-between worlds somehow. Often the idea for the image will come from the character of the button itself - the grain of the wood or a variation in the colouring of the material's surface. Sometimes I have a preconceived idea of a scene or character. 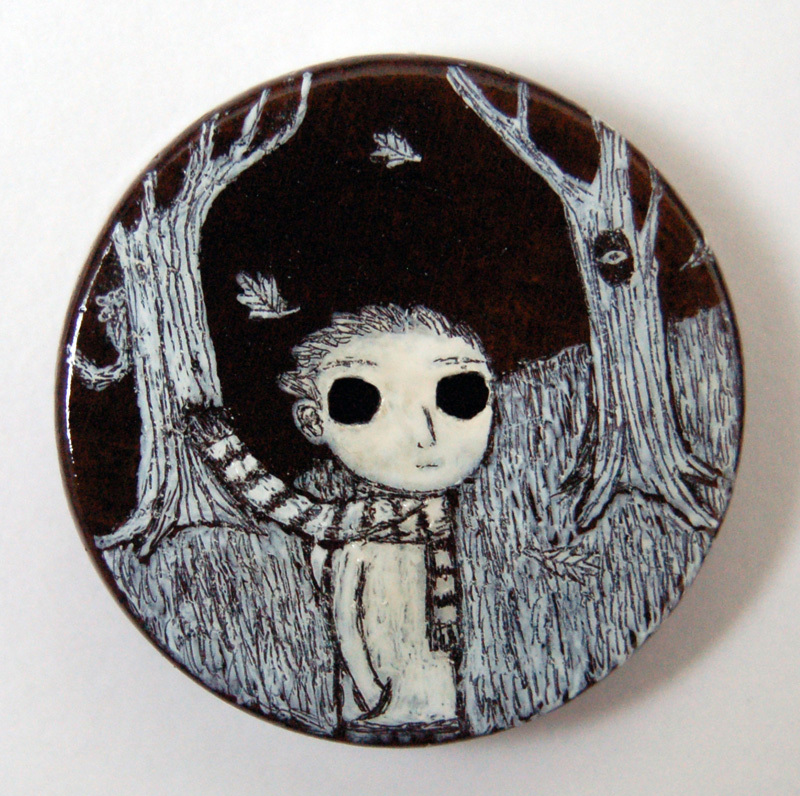 I have also produced a number of commissioned buttons including portraits and fictional characters. I scratch into ink with a pin or engraving tool, adding and taking away until I'm satisfied. Such is the scale (a centimetre or two across) of the work I've often included details I'm not certain will be noticed by everyone. The work is then left to dry before a coat of varnish is applied. The finished pieces are then placed deep tulipwood box frames which I stain up myself. I have been lucky enough to have been accepted into the Royal Academy Summer Exhibition with a button work similar to this and also, in another year, with a box of 'lost insect' buttons. Click here to read an article about 'The Button Show', an exhibition in New York featuring my work.